Mirrorless cameras have matured into serious alternatives to DSLRs. Some of the biggest brands failed to anticipate that success. One of them, Canon, is now trying to play catch up. Their first attempt, the EOS M, dropped this autumn after much anticipation. An 18-Megapixel compact interchangeable lens camera with an APS-C sensor—essentially a shrunken down Rebel T4i. Travelers, casual shooters looking for a high quality results, and Canon fanatics. Instead of chasing the trend of retro-styled cameras, Canon is sticking to their guns with the EOS-M. Its design resembles that of many compact point-and-shoots in their lineup. Overall it's rather bland, but efficient and well-built. Gripping the camera isn't as comfortable as, say, a Sony NEX-6, but it is easy enough to get used to. 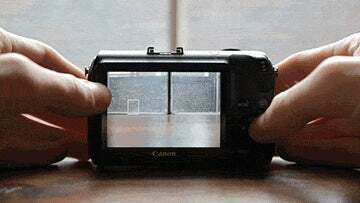 The EOS M is controlled manually through it's capacitive touch-screen (more on that below), lacking the slew of physical dials that many enthusiasts demand. It is clear that this camera is geared heavily toward a streamlined, point-and-shoot experience. There is no viewfinder or pop-up flash. Instead, Canon offers an external flash, connectable by hot-shoe, for $150. The pictures coming out of the M are of great quality, and the 22mm f/2.0 kit lens is no slouch. Noise at high ISOs is only slightly behind the Sony NEX-7, which we directly compared RAW files with. Check out our Flickr gallery of full size images. The EOS M system only launched with 2 lens options—the 22mm f/2.8, and an 18-55mm f/3.5-5/6. This severely limits your options if you are serious about using a variety of lenses (and if you aren't, a camera like this may not suit you). Canon does offer an adapter that allows you to use their entire line of EF glass with fully-functioning auto-focus and aperture control. But slapping a giant DSLR lens on this camera kinda defeats the purpose of compactness. You can also shoot HD video with the EOS M. It will look exactly like video shot with the T4i—decent image quality, crappy autofocus—and still no better than what you've seen in the past couple of Rebel iterations. Pretty much every review for the EOS M thus far points out a particularly crappy autofocus. It's true, compared to some of the other popular mirrorless cameras out there, the M will seem downright sluggish. It isn't terrible, but it is wholly unpredictable, which can be trouble for action scenes or fleeting street-photography. The one particular strength that is unmatched by any mirrorless camera to date is the touchscreen interface. 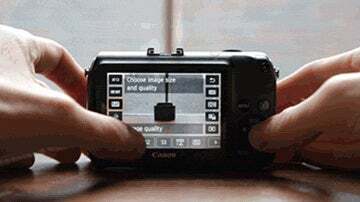 Other cameras feature touch-screens, but none work as smoothly or easily as Canon's. The lack of physical controls is easily forgotten when you see how intuitive it is to access settings by tapping the rear display. The slow autofocus is an easy target here, but I think the lack of lenses is a bigger problem. The entire point of interchangeable lens cameras is...the...interchangeable lenses. If there aren't any lenses to interchange—well you get the point. Perhaps Canon will grow its EF-M line of lenses into a thriving ecosystem, but it will take a while. Just look at Sony—their E-Mount system is almost 3 years old and they still get heat for not having enough lenses. Touching the screen to select a focus point is nice, but the focus point on the EOS M is giant. It's more like a focus region, which means it only works when you are shooting at a wide angle with a relatively deep depth of field. But try selecting someone's eye while shooting a portrait. It gets tricky. All of our Flickr sample images are RAW files converted to JPG, with no noise reduction of any kind. No. Canon's effort on the EOS M buttresses those frustrated users who believe that their beloved brand is focusing more on protecting their markets than they are on innovating. The M is just too safe and too boring in a time when other companies are pushing the envelope and offering more in almost every respect. Olympus offers lightning fast focus and a great many lenses. Sony offers ergonomics and versatility. Fuji offers insane image quality and control. Many of those cameras feature built-in flashes and viewfinders. The EOS M contains some minor victories, but can't make a case for itself as the mirrorless camera you need.